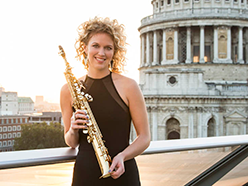 Following the successful debut of her Screen and Sax project at Equator’s ‘Women of the World Series 2015’ at Kings Place, the brilliant saxophonist Hannah Marcinowicz has further developed her association with the cream of British female soundtrack talent. This concert will feature new works written for saxophone and piano by Jennie Muskett (Spooks) and Charlotte Harding (BBC). There will also be a new arrangement of the Musical Zodiac by Classic FM Composer in Residence, Debbie Wiseman MBE (Wolf Hall, The Promise), an extended version of Poldark by Anne Dudley and music from Rachel Portman (Chocolat, One Day, Miss Potter). Han nah Marcinowicz made her Wigmore Hall debut in 2008. Since then, she has performed as a soloist at venues including the Royal Albert Hall, Royal Festival Hall, Queen Elizabeth Hall and Barbican Centre to great critical acclaim. 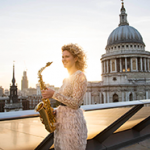 She has performed with the UK’s leading orchestras, including the London Symphony Orchestra, Philharmonia Orchestra, BBC Concert Orchestra, Royal Philharmonic Orchestra, London Philharmonic Orchestra amongst others. A regular performer at the BBC Proms, she has appeared as a featured soloist under Sir Colin Davis and Paul Daniel. Her international performances include concertos and recitals in the Middle East and Far East. She has also appeared as a guest soloist with the European Union Chamber Orchestra. Hannah frequently records for film, television and radio. She is featured as a soloist on the soundtrack for the United Arab Emirates Pavilion at the Milan World Expo in 2015. Hannah is currently collaborating on a solo album project with the award-winning stage and screen composer Jonathan Goldstein.